needing reliable power, with a full line of diesels from 49 to 4400 hp. Superior Fuel Economy – Cummins offers leading fuel economy for a lower cost of operation and higher profitability. Proven Dependability – The reliability and durability of Cummins engines have been demonstrated in every type of vehicle and equipment working every type of duty cycle, for decades. World Class Support – Cummins has one of the largest and most capable parts and service networks in the business. Cummins serves customers in approximately 190 countries and territories through a network of approximately 600 company-owned and independent distributor locations and approximately 6,500 dealer locations, providing the best service density in the business. Leading Performance – Cummins fully integrated technology, from air handling to exhaust aftertreatment, allows us to optimize performance in ways that other manufacturers can’t match. Broadest Product Range – No one has the breadth and strength of the Cummins product line, which includes diesel, natural gas and dual fuel engines from 2.8 to 95 liters. 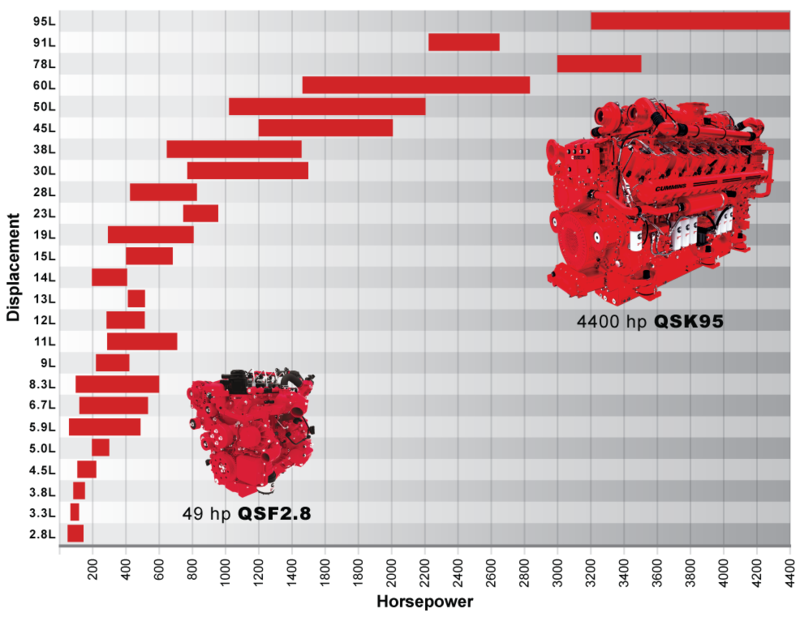 To learn more about Cummins engines, contact a local Cummins DKSH Sales and Service representative or visit our engine specification library by clicking the button below.